"Is there any way to help me convert VOB video to MPEG format for directly playing on my Mavericks?" "It is so fantastic that if the VOB files were MPEG videos stored on my hard disk so that my friend will show me how to add some special effects in my home this weekend." Most of time we will come across these questions similar to how to turn VOB files to MPEG when we are surfing on the internet. Those people, who are badly in need of converting VOB, have the same purpose which is making a particular video by adding soundtracks, subtitles, etc for surprising someone or sharing by uploading to YouTube website or Blog. To reduce VOB file size and transcode to VOB from MPEG format on Mac, you are suggested to have a shot on the highly sought-after MacX Video Converter Pro, a professional vob to mpeg converter which is able to super fast switch VOB files to MPEG with far smaller file size on Mac OS X (macOS Sierra/El Capitan included), as well as VOB to MP4, MOV, AVI, MKV, FLV; MKV to MP4, MP4 to MP3, and more. And if you wanna decode and encode VOB to iPhone X/8/7/7 Plus/se/6S/Plus, iPad Pro/mini 4, Android, Microsoft device, this Mac video converter for VOB will be your best choice to make this happen with no third party involving. 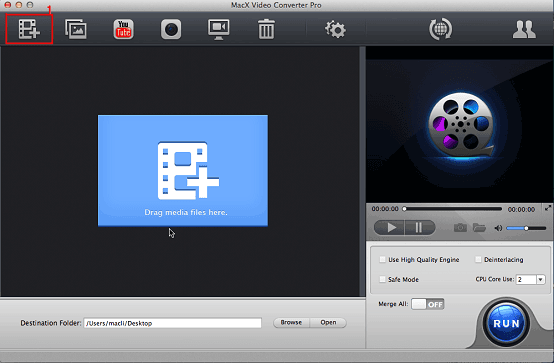 For Mac users, free download the VOB to MPEG converter on Mac. If you are a Windows user, please download the Windows VOB to MPEG converter to finish the process. Launch MacX Video Converter Pro and import the VOB files by clicking "Add Files" Button on the software main interface. 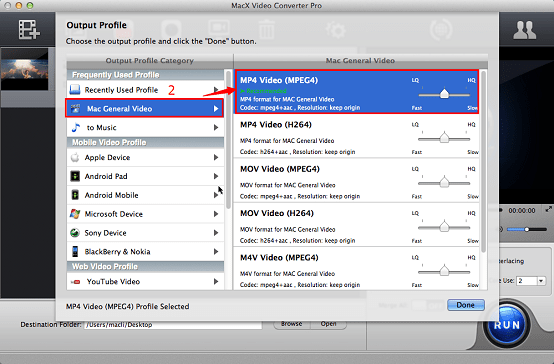 Select the MPEG as the output profile in the "Mac General Video" subcategory of output profile. Clicking "Browse" Button to store the target video file. Clicking "RUN" to start converting VOB to MPEG on Mac. You have chance to view the process or cancel it at anytime. 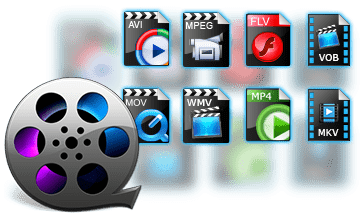 Warm notes: You are also allowed to turn the HD videos to various HD or SD video formats, such as MKV to AVI, WMV HD video to MP4, Blu-ray video to MOV, etc and convert video to devices, e.g. transcode MKV to iTunes, AVI to QuickTime, MP4 to iPhone and more.